I recently changed from a Blackberry to a Samsung Android phone and obviously the first app I searched for was one relating to cruise ships. Well, imagine my delight when I found several. I have to say one of my favourite ones is the ShipMate app. I say favourite one, there are actually quite a few, more or less one for each cruise line in fact. 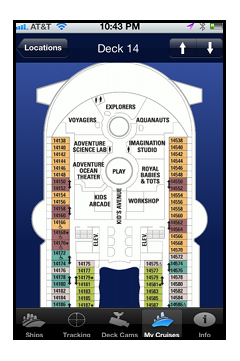 They are packed with quirky features like full deck plans, this being a great and quick way of finding out where a particular cabin or facility onboard is. You can also find information for upcoming cruises including the destinations and how long each voyage is. I am told that the same app for the iPhone, iPad etc is actually better than the ones on android but I must admit I am pretty happy with the ones I have. One other great feature of this app is that it does NOT require internet access. You can simply put it onto airplane mode and avoid sky high charges for the data usage. It really is a great little tool to have and it’s conveniently stored within your phone.